In Reticulate Epistemology I wrote that knowledge is a network. That is to say, there is no privileged position within the network of knowledge; there are places within this network that we know better than other places, simply from the accidents of history, but the network of knowledge has no center and no periphery, potentially extending to infinity in all directions. Over the past couple of decades the internet has emerged as the primary vehicle for knowledge exchange and representation. The internet was never intended as a form of knowledge representation, but this is what it has become. Because knowledge is now massively stored, communicated, and collaboratively constructed on the internet, the internet itself expresses the structure of human knowledge. And so we now have an electronic network that reflects the epistemological network of knowledge; each mirrors the other. It is very easy today to speak of “knowledge workers” and “knowledge economy” and even “knowledge warfare,” but these terms have already become so hackneyed they are used more frequently in ridicule than in sincerity. If we take the idea of information warfare seriously, we must understand that this is ultimately an epistemological undertaking, and that if we cannot understand knowledge warfare on the basis of the principles of knowledge we will not understand it at all. We may give a superficial appearance of knowing what it means to go to war against an enemy’s knowledge resources, but without knowing what knowledge is and how the enemy brings it to bear in order to “compel the other to submit to our will” (as Clausewitz put it in his first paragraph), we will have only the appearance of knowledge warfare rather than the reality of knowledge warfare. 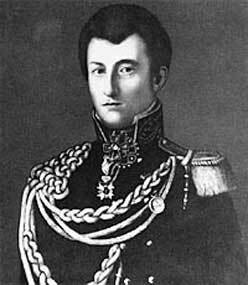 Carl Philipp Gottlieb von Clausewitz (01 July 1780 to 16 November 1831): even in the Age of Knowledge Warfare, Clausewitz remains our touchstone and point of reference. We can paraphrase Clausewitz’s classic formulation of war to arrive at an uncompromising formulation of epistemological warfare: “Epistemic war is an act of epistemic violence intended to compel our opponent to fulfill our will.” It is not only the case, as Clausewitz writes, that “Violence arms itself with the inventions of Art and Science in order to content against violence,” but violence may take the very form of Art and Science, so that Art becomes a violent art and science becomes a violent science, as is the case when knowledge is mobilized directly in the cause of war. There is here no intermediary between Violence on the one hand and Art and Science on the other; there is only Violence that sometimes takes the form of Art and Science. In this sense, epistemological warfare is the most direct and brutal form of warfare. Each civilization is not only distinct, but each is based on a distinct idea of civilization. Thus civilizations clash because each has an idea of what civilization is and ought to be that is not shared by other civilizations, each of which are similarly are based on an unshared idea. Thus it is not the case that all civilizations embody, each perhaps in its own distinctive way, one and the same idea of civilization. In short, civilizations are incommensurable. In the context of epistemological war, it seems to me that the distinct ideas of distinct civilizations will mean that distinct civilizations will have distinct epistemic paradigms. In other words, the knowledge cultivated for the sake of war, and the knowledge brought to bear for the sake of war, will be largely incommensurable. An epistemology is embedded within and draws its inspiration from the metaphysic that is captured by the central idea that is peculiar to a given civilization. In other words, our epistemic paradigm is a function of a metaphysical paradigm. Because a cosmic war does not occur in a cosmic vacuum, but it occurs in an overall conception of the world, the grievances too occur within this overall conception of history. If we attempt to ameliorate grievances formulated in an eschatological context with utilitarian and pragmatic means, no matter what we do it will never be enough, and never be right. An eschatological solution is wanted to grievances understood eschatologically, and that is why, in at least some cases, religious militants turn to the idea of cosmic war. Only a cosmic war can truly address cosmic grievances. These considerations of cosmic war are particular cases of the general principle that epistemic paradigms are a function of metaphysical paradigms. This holds for the four conceptions of history we have previous discussed in detail — the eschatological, the naturalistic, the catastrophic, and the political — as well as for less comprehensive, more specialized conceptions of history that we invoke as it serves our purposes in specialized contexts (for example, the economic interpretation of history, the epidemiological conception of history, the demographic conception of history, and so forth). Waging epistemic war is ultimately a means to the end of waging metaphysical war, and metaphysical war is the ultimate category of war, even beyond the idea of a war of annihilation or a war of extermination. We can imagine a case in which a war of annihilation successfully annihilates its object, or a war of extermination successfully exterminates its objects, but the idea of the object remains. To take a particularly horrific example, the Nazi genocide of the Jews was undertaken as a war of extermination, but Hitler and many top Nazis were fascinated by the Jewish race, and Hitler actually planned to open a museum to the exterminated race of Jews after he had won the war (if he had won the war). Thus we can see that there is a step beyond even the Nazi idea of a mar of extermination. The closest we can come to an example of metaphysical war is the Stalinist attempt to utterly obliterate the memory of disgraced representatives of Soviet communism, or the Egyptian monuments in which the names of heretic Pharaohs have been hacked out of the stone in the attempt to eliminate all memory of them. Wars of annihilation and wars of extermination are existential wars. As we have seen here, existential wars fall short of metaphysical war. All wars are limited wars in so far as they fall short of metaphysical war. Distinct epistemologies grounded in distinct metaphysics govern all that is thought and all that is understood and all that is done, so that while all wars are limited that fall short of metaphysical war, the idea of metaphysical war descends, in a limited and fragmentary way, into all limited wars. There is a sense, then, in which the obscured and intermittent presence of metaphysical war within actual limited wars is the telos, the end, the aim, the aspiration, and the implicit ideal of all war. How does the metaphysic at the heart of a distinct civilizational idea descend into epistemology, and from epistemology into the whole of human life? It was one of the achievements of twentieth century philosophy to call attention to what we now know as theory-laden perception. (I have discussed theory-laden perception in The Incommensurability of Civilizations, cited above.) Not only is all perception theory-laden, but all observation is theory-laden, all action is theory-laden, all understanding is theory-laden, and all expression is theory-laden. Nietzsche came close to expressing the theory-ladenness of human experience when he said that rational thought is interpretation according to a scheme that we cannot escape. And Nietzsche also said that there are not facts, only interpretations (this is sometimes called his perspectivalism). This Nietzschean idea of interpretation according to a scheme we cannot escape is particularly crucial for self-deception and confirmation bias, which in warfare leads to death, defeat, and possible extermination. Consider, for example, the Boyd cycle, beloved of recent strategists. I do not want to demean the Boyd cycle, which I find to be of the greatest interest, but it falls far short of the requisite comprehensivity necessary to strategic thinking, much less grand strategy. 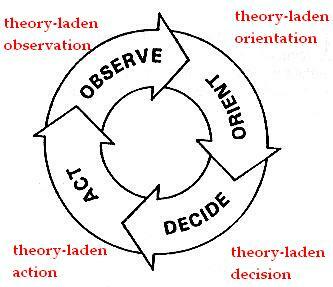 The Boyd cycle is also called the “OODA loop,” where “OODA” stands for observation, orientation, decision, and action. (Many strategy bloggers have written extensively on this topic, so I will leave it to the reader to follow up on references; there was also quite recently an entire conference devoted to Boyd’s strategic ideas.) Once we understand that human experience is a function a particular epistemology, which in turn is a function of a particular metaphysic, we see that even given the best strategic intentions that the Boyd cycle is contaminated because observation will be theory-laden, orientation will be pervasively theory-laden, decision will be theory-laden, and action will be theory-laden. This does not mean that execution of the loop will not be effective, but that we should not fool ourselves into thinking that we have gotten “inside” the decision loop of our adversaries, unless our adversaries are very much like us. Germans and French on the Western front would be a wonderful instance of an effective opportunity for the implementation of the Boyd cycle, but the further a given civilization is from our own, when its representatives go to war against us, they are not getting inside our decision cycle and we are not getting inside their decision cycle, because these decision cycles are incommensurable to a greater or lesser degree. The wider the gap between the theory presumed by the enemy and the theory presumed by ourselves — the theory being the burden under which our observation, orientation, decision, and action labor alike — the more incommensurable the decision loops. These cycles are not likely to be absolutely incommensurable, but given the fog and friction of war, what incommensurability there is will chaotically and catastrophically escalate until the two sides have little or no common ground except that the last man standing wins. It remains to observe that what we are here calling epistemological warfare could be assimilated to what some recent writers on strategy are calling fifth generation warfare (5GW or 5GMW). 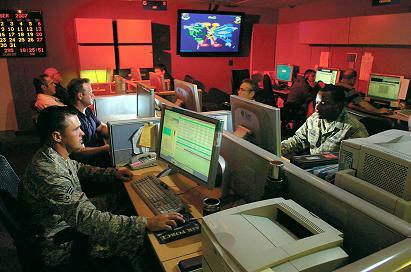 The Committee for Public Safety characterizes 5GW as follows: “5GW, which may or may not stand for ‘Fifth Generation Warfare’ or, more likely, stands for nothing, is a school of strategic thought focused on the indirect and surreptitious application of influence.” Beyond the breakdown of the division between state and non-state actors, between regular and irregular forces, between insurgency and counter-insurgency, between combatants and non-combatants (ways of characterizing 4GW), there will come the breakdown between the very distinction between war and peace, violence and non-violence, between agency and non-agency, and this is the arena in which knowledge can be decisive in war, or something equivalent to war in non-militarized contexts. But we shall save our critique of the generational conception of war, and the place of knowledge within it, for another day.